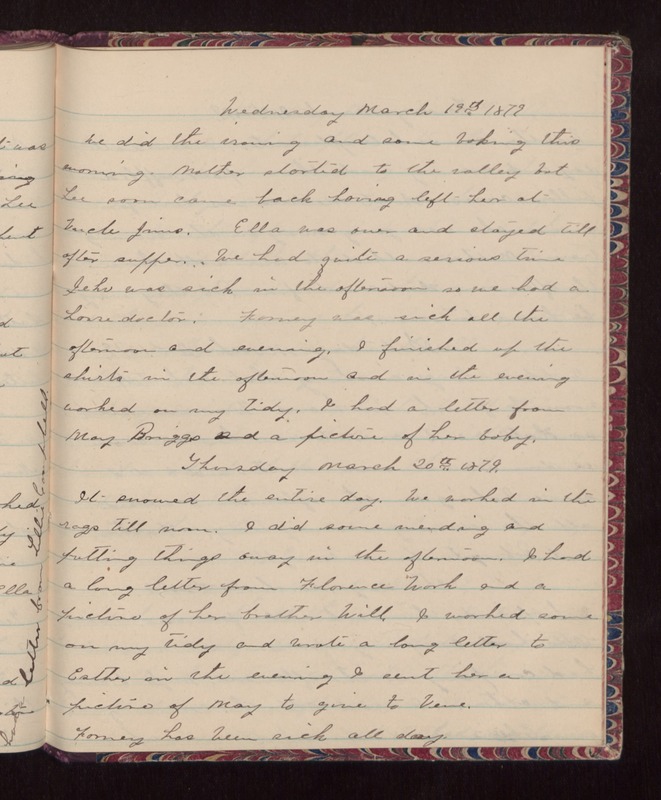 Wednesday March 19th 1879 We did the ironing and some baking this morning. Mother started to the valley but Lee soon came back having left her at Uncle Jims. Ella was over and stayed till after supper. We had quite a serious time Jehu was sick in the afternoon so we had a horse doctor. Furney was sick all the afternoon and evening. I finished up the shirts in the afternoon and in the evening worked on my tidy. I had a letter from May Briggs and a picture of her baby. Thursday March 20th 1879. It snowed the entire day. We worked in the rags till noon. I did some mending and putting things away in the afternoon. I had a long letter from Florence Work and a picture of her brother Will. I worked some on my tidy and wrote a long letter to Esther in the evening I sent her a picture of May to give to Vene. Furney has been sick all day.